“I have learned from an eagle that has very away visibility. It means I always trying to put my vision and mission not only for the short term but even for long term. I also always trying and learning to look every difficulty with the eyes of faith not only by naked eye. As long we doing what is God wants, I think we do not need to doubt and worry about the future success. I always trying to put and use my faith as foundation. With having strong faith to God we able to face any difficulties and even do not to worry and doubt about what tomorrow will bring” Explanation above is the statement from one my business friend when she asked how to see and face any difficulties in life. What a wonderful and encouraging verse. But once again, without faith it is impossible to believe. Our ability to have far visibility is very limited. Not be able to take us to see the future fulfillment. We just wait and wait. And oftentimes it will make us waver and doubt. Then how we could believe? Once again Bible verse in Hebrews 11:1 should to be our foothold so that we can see the evidence of everything that have not seen. Only by faith that will enables us to keep calm, trust and keep walking without doubt to see our future success. This means that Jesus wants our faith to grow bigger and stronger day by day, because He wants us to build our trust as the foundation of a strong faith. Trust is the potential energy that is able to move what might impossible become possible. Then how to keep our faith continues to grow? There is only one way, that is involving God in the process of our faith growth. We can ask the Lord to be involved in our life so that the faith we try to grow will be even increase. The result of our spiritual and faith growth will be seen in how we react when facing difficult situation and uncertain future. Our reaction and how we look any difficulties will represent indeed how big our faith and how far we believe to God’s plan and His wonderful promise. Let our eyes just looked at the difficulties that we are facing would not give any benefit. We need open our eye of faith to see promises which God has provided to us. We need our eyes of faith to looking away to overcome every difficulty. The eye of faith needed in order to we do not waver, doubt, and worry in running our life. My dear readers, actually I don’t know what is your burden now, what of difficulties you face today, how worry you are to see the future. This time I would like to encourage you, if we face it all with faith, we open our eyes of Faith and put it as a strong foundation, I strongly believe that we wouldn’t worry about everything happens in our future. And we will see the fulfillment of God’s promises. Faith is like a baby who always needs the best nutrition to keep growing. The best nutrition for the growth of our faith is God’s words. Let us continue feed our faith to grow by reading and comprehend God’s word every day and implementing it by deeds. further strengthens our relationship with God through prayer, Involving God in every step of our lives, ask for the strength and wisdom, and let His Holy Spirit anoint our life so ultimately we will have faith as a mustard seed. The question is: Do we have a yearning to continue to make our faith grow? 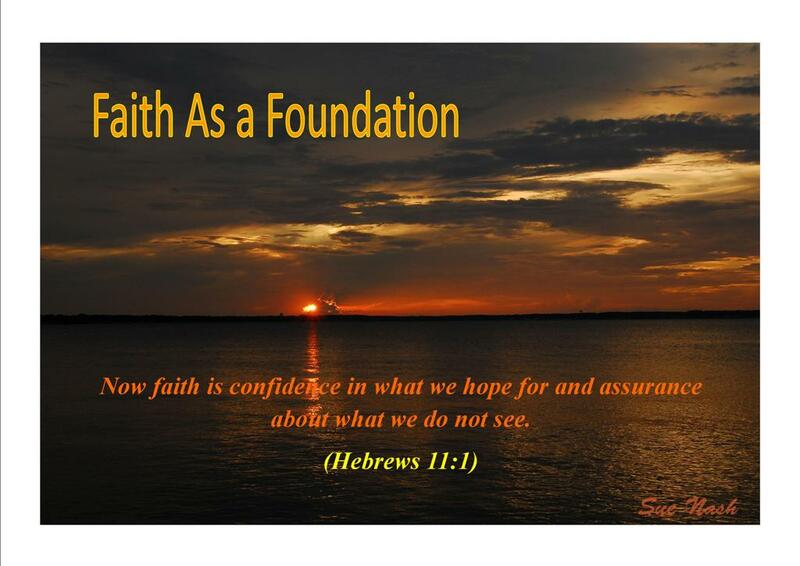 Or whether we’ve put our faith as a solid foundation in our lives? Do we’ve opened the eyes of faith to see wonderful future without worry? Let’s ponder together. Amen. 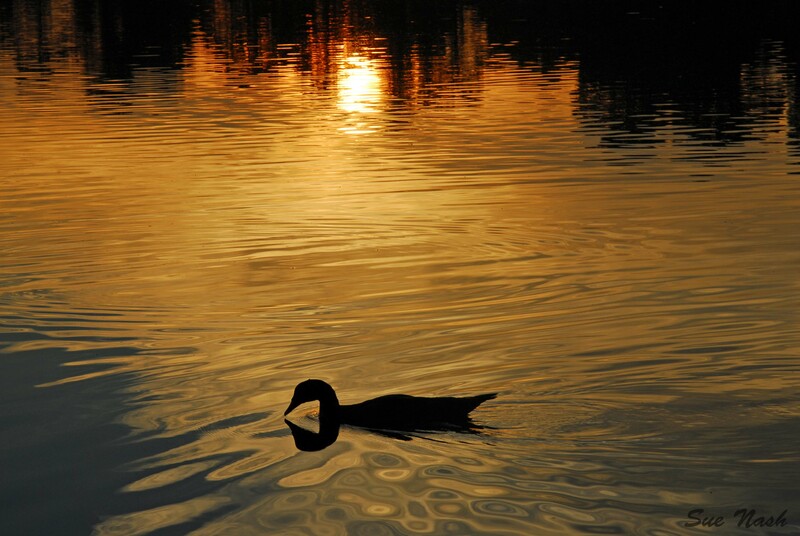 In our lives which getting difficult day by day, there are many people lose their peace. We are living in hard and difficult situation that could raises pressure to us. We could easily got stress, depression, worry and fear. And it all will quickly seize our peace. Life become bitter, we loosing smile from our face, we have unstable emotion and become like dynamite that could explode easily, and many other bad things. The question is… Is this God wants from us? No! God wants us full of peace which bring joyful in our lives. If God wants it, what can make us still have peace? In fact, God even has been providing for each of us who believe in Him. If we read this verse carefully, we will found a correlation between God’s word righteousness with peace and quietness. We will be difficult to live with stress, fear and worries. 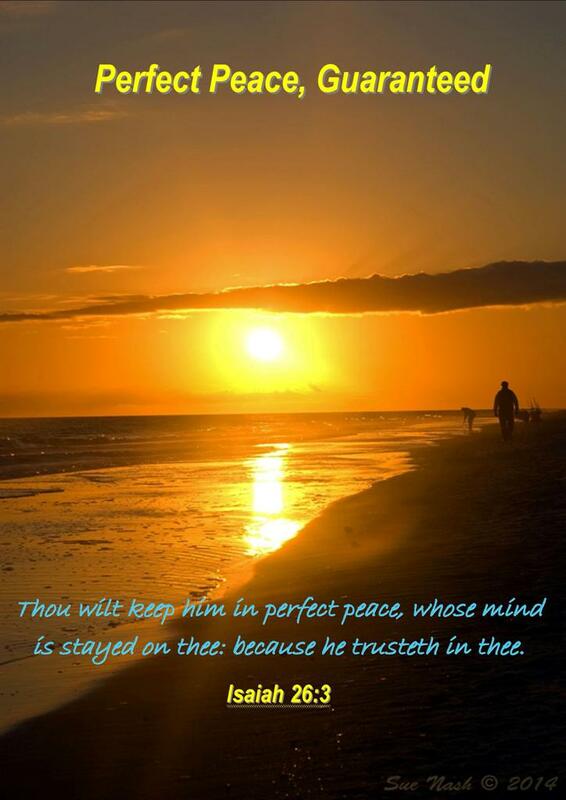 But for the believers, for God’s child who always want live with totally put trust in God’s hand will have peace that gives us quietness and peace. It is one thing that cannot be bought with money. And it is not come from a condition but it is only from God and His righteousness. Knowing God and Jesus will make us endowed with grace and peace. Thoughts and feelings is one of our weak points to watch out for. When we continue to think how hard our problems, just focus on difficulties, stress, anxiety, and think negatively, it all can poison our minds even then slowly but sure we will lose our peace. Very ironic if we were believe in God but still haunted by thoughts and feelings like that. As Paul said, we must focus our minds on Jesus as the source of peace. My dear readers, few times ago I was asking my sister in Christ Sue Nash to write a poem for me and now I will end this post with her beautiful, strengthen and comforting poem to ponder together. Thank you very much for your beautiful poem, my dear sis Sue. God Bless you always. Our fears wouldn’t have free reign. Frowns and fretting would not remain. This life wouldn’t take its toll. Help and blessings would soon unfold. Rest and comfort would be our realm. No trouble would make us flee. Perfect peace would be guaranteed. Talk about an eagle, eagle is fascinating fowl. Have wide wings. Even the widest ever measured was as wide as 2.5 meters (8 feet). Eagles were Famous for its endurance when he flew. Although needed the considerable energy for flapping wings at first, but once he flew, an eagle only put out very low energy. The research results stated that the eagles only take an average of 2 minutes to beat their wings in every hour of flight time. Eagles can fly long without flapping their wings. Eagles can fly to hover in the air (gliding) or fly off (soaring) by utilizing the thermal air / heat that rises on the open mainland. By doing so, he only requires very low energy to be able to fly longer. Not only that, eagles can travel an average distance of 75 to 125 miles. That is the secret of eagles’ power which is capable of flying very high. Eagles will never be tired because he did not have to use much energy to be able to fly for a long time and a long distance. But, do not think that when the baby eagles are born then they already were so. Eagles are a fragile beast when they were a child so their parent will usually bring them to stay in high peak and train them to fly. The parent would drop the young eagles down and let them screaming before finally practicing flapping their wings. When the young eagles start flapping their wings, their parent was ready to help when they are going to weak and fall and they will rise up and fly became more powerful eagle. I am thinking deeper. When we are in problems that come repeatedly, we can feel our strength declining both physical and mentally. The weakening of our strength will only make us more helpless in the face of problems that we have. But God’s Word teaches us, that the key to obtain the strength in dealing with various problems is waiting upon the Lord. Waiting upon the Lord means that we continue to hope in the Lord, directing the eyes of our hearts to God, praying to God, reading and meditating on the God’s word, obedient to His commandments and uphold our faith and hope to the God. By keeping our fellowship with God, we will be in a condition that is always waiting on the Lord. The existing problems should not hinder us to still come to worship Him. We must still following God whatever is happening. When we let go of our hope in God, we will increasingly lose the strength to walk forward. Physical strength and mind that we have is not enough to deal with the entire burden, because we have a limit in our ability. God wants us to be as strong and brave like an eagle. 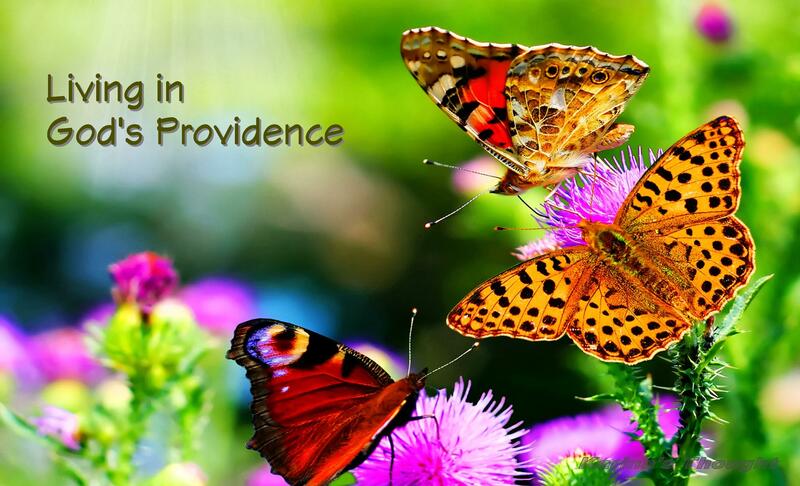 He wants us to continue to train our wings of faith to face and through any life challenges. Winds and storms in our lives will force us to fly and like the parent eagle who keeps an eye on their child learning to fly, God will watching over and will help us so we not be allowed to fall. When we come to God and always waiting for Him, we will get the new strength. New strength that God has given will enable us to rise to undergo what is in the front of us. God will give us a new spirit, a new wisdom, a new joy, a new hope, so that we can stand up straight in running this life. 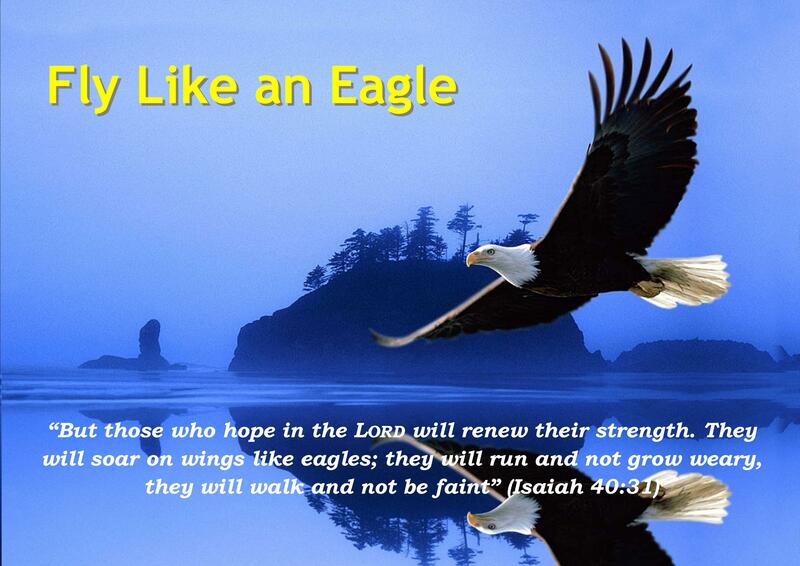 Like an eagle who never tired by the time he flew, so it is with us who waiting on the Lord. We will never feel tired because God has given us new strength. We can deal with no matter how hard. We can get out from the various problems. We can undergo existing hardships. We did not even realize that so many miraculous things that we have been through, because God has given us the strength to through it all. I ask one question. Are there people around us like family or friends who could say like God says in the verse above? Is there anyone who could guarantee by saying: “….And I will give you rest”? No nothing at all. So through these powerful verses we all know and be reminded where we should to go when we are weary and burdened and where we should put our hope. I am not saying that our lives would become so easy. We will still have problems ahead but we must face it. No mater we like or not, our life still must go on. Let us continue to direct our hearts and minds to God only. Keep waiting on the God, maintain our relationship with God so that our fellowship with Him getting close and closer day by day. His loving hand is always open for us comes to Him. Continue to train our wings of faith and He will give us a new strength so we can have power and fly high tirelessly like an eagle. Amen. This post is a response to my friend who was having financial problem. Through email she tells how hard she trying to overcome her financial problem. She asked me not for money but just asked me to pray and give her a bit encouragement thought so that she could endure to deal with her problem. In the very tough situation today, so many people easily sigh about their problem. How hard they trying to meet so many needs even just their daily needs. Living cost getting higher, got pressure and stress in their jobs, financial responsibility that must be met, and so many other problems that should to face. All of it would cause worry and fear. It is written in Luke 12:24: Consider the ravens: They do not sow or reap, they have no storeroom or barn; yet God feeds them. And how much more valuable you are than birds! My dear readers, this is the point that we have. Worrying does lead us to nowhere. Thus, what can we do? It is a good question! What else can we do? Remember this; God has given us a lot of options. We can do anything. We can do to help solve our difficult situation except worry! Once again we are not like birds. God gave us incredible mind to us and we can use it to explore and find out any solution and possibilities to overcome our problems. That is the more practical thing we should be doing. Ok, another question arises. What if we couldn’t think and find of any solution? Well then, if we can’t think and find of any? Once again, worry isn’t a part of the solution. The very best way are: keep trusting God, Keep faith in God, and Resting in God’s wisdom and providence. And this is the point that God wanted us to do. Let us try to do everything as best we are and then submit the rest to God. A higher power than we have definitely can overcome everything that we can’t. It seems so simple and easy. Then we have other worries and ask: How come? We have only a month’s budget and still have other needs. What shall we do? My lovely friends, indeed, God really understands our fear and worry and He knows that many times we mistake those fears and worry for a real need. A fear and worry is something that may not happen. A need is something we have to address at the very moment where we are. So if we have got a budget for a month groceries, that means God has given us the means to survive today and for the rest of the month as well. What’s bothering us is not be met, but future need, a fear that may or may not come into reality. I was remembering about the story of Elijah in 1 King 17:1-9. This is very different from way we want to be provided for. We have been used to having a lot of surplus in our hands, or some kind of insurance that will see us through in case some unexpected things happen. If we don’t have a big allowance like that, we become fearful because we don’t know where we are going to find the things to address our needs. I think this isn’t wrong to think logically. Indeed God has given us a mind to plan wisely and to take care of our finances. The wrong thing is when we limit ourselves to our plans and when our plans don’t work well, we panic! We lose heart and we forget from where all good things really come from. From God! My dear readers, this post will end with contemplation. Anxiety and frightened just make us feel the problems is more severe than the actual reality. So, what for we are afraid and worried if it would only burden ourselves. The important thing that should we do are, point our hearts and minds on God, not on the problems. Believe in God, not on ourselves. Put “sense of secure” on God, not on treasures. Do the best which to be our part, let God doing His part and then God alone who will make it perfect. He is never too late. With faith in God, we must believe that God will meet all our needs just in time. May not be excessively but sufficient. Amen. This post is collaboration between me and my sister in Christ from Indonesia, Sella Irene. And special for this post she wrote a beautiful poem titled “The Meshes of Worries” To read her poem please click here. My post this evening, once again was inspired by blog of my sister in Christ, Sue Nash. I inspired by her beautiful photos. I always really love every photo on her blog. I don’t know all of you have the same opinion with me or not, but for me, her photos not just beautiful but even there is something special on it. I was remembered with my husband statement about photo. He said that a great photo must have “Soul” and could speak without using any words. Honestly I must admit that I found it all on Sue’s photos. When I see one of her photos, I am contemplating something. She is probably not a professional photographer but she done very well. Well, I know that is not an easy work. Beside find the right angle, trying to get the best exposure, observant in seeing something interesting from their objects, and doing many other photographic techniques, she also need to know when the right moment to shoot the object so that later on its object will be a special photo. I conclude that the different viewpoints will give the different results. The different moment also will give the different meaning. Often happened an object that looked unappealing will be a very beautiful object if we can see it from a different and appropriate viewpoint. I pondered deeper. Looking at a photo object is not much different to see and judge to someone. In our daily lives, perhaps we oftentimes see someone from the negative side only. We are so difficult to find and look at the positive side. We are more likely criticized, accusing, insulting or even blasphemous than giving a compliment. Whereas, just as a photo object, they are certainly have good and positive side as well. It all just depends on the viewpoint where we see it. We often forget that whoever they are, they are also God’s creation. We often forget that even though they have flaws, but they also have the advantages. Even we tend to make a distinction wall. Yet in the eyes of God we all are same and precious creation. We all are His Masterpiece. There is an old wise word that I always remember. “Don’t judge the book by its cover” My dear lovely reader, perhaps we often judging someone only from their appearance. We often did not realize and forget behind their appearance they may have something special. We are forgetting that they are also God’s creation. We are created in His own image. If man was created so special, is even said to fit the image and likeness of God himself, of course we cannot deny that we are so precious in God’s eyes. If so, is a big mistake if we are always judge people from the negative side only or we are not trying to look someone from the positive viewpoint. Look at how the Lord appointed His chosen people in the whole story of the Bible. From the beginning God pointed His prophets in the Old Testament until the disciples who chosen by Jesus, they are just ordinary people who may not seen or even despised by their society. God did not choose a king, wealthy people, influential and powerful people, or extraordinary smart people, but God more pleased choosing ordinary people who become extraordinary people in His hands. God chose Christians killers, terrorists on that era who later repented and extraordinarily work for God, Fishermen, tax collectors, shepherds, people who have difficulty in speaking, a servant and others. They amazingly can be transformed by God and used by God. This means, people who are worthless in the others’ eyes could become a very valuable people in God’s eyes. In God’s hands a useless stone could become a priceless jewelry. We are so precious in His eyes, then let we are also appreciate one and another, which is very special in God’s eyes. We all are His masterpiece. Amen.